Beginning Times is now open at Globe at Hay, Hay-on-Wye. Open Thursday to Saturday 9.30am to 11pm, Sundays 9.30am to 5pm until 30th August. The exhibition preview is on 3rd July 6-8pm, all welcome. In his first solo exhibition in Britain, Kenji Lim exhibits a series of drawings and paintings, including some specially produced for the large and unique exhibition space that the Globe at Hay provides. The influence of printmaking and etchings on Lim’s work can be seen in atmospheric pen and ink drawings and the highly restricted colour palette of the paintings. This idea of mark making to create form and texture is translated into monumental form in two large canvases where small brush marks transform the surface into a tapestry in paint. The architectural scale of these paintings marks them as immersive experiences for the viewer. Dark Forests, lonely huts, cairns, and wild animals all feature in Lim’s pictures as he presents us with a fairy tale world at once familiar and unfamiliar. His work references folk tales and Nordic mythology and confronts the viewer with mysterious scenes which tell conflicting and ambiguous stories. They are a sideways look at the world through the prism of fairy tale - or is it vice versa? - A viewpoint where we can see the slippage between the two. Huts - based on Lim’s own working studio - found in forests, mountains, and under bridges are welcoming places of refuge but also threatening. We don’t know who is keeping the lights on and how they feel about visitors. The same can be said of the fauna in the work, where gigantic red pandas appear equally as endemic as wolves, eagles and wildcats. We are simultaneously wary, fearful and enchanted. Nostalgia for these traditional narratives and the ambiguity between their familiarity, perceived security, and the threats described by them, causes an emotional tension in our engagement with the scene. The enigmatic nature of our encounters leads to questions about our connectedness to wilderness, to our past, and to our cultural memory. Kenji Lim was born in Singapore and lives and works in Herefordshire. He studied at The Ruskin School of Art at Oxford University and whilst there was shortlisted for the Beck’s Futures Student Prize for Film and Video (2002) at the ICA. He has exhibited in group shows in the UK including Love and Death as part of Fringe Arts Bath (2015), and at open competition exhibitions including EWAAC (2014) and Art Gemini Prize (2014). He has also exhibited at Design Festa Gallery, Tokyo, Japan (2014) and was included in The State of Art: Landscape & Portrait #1 (Bare Hill Publishing). 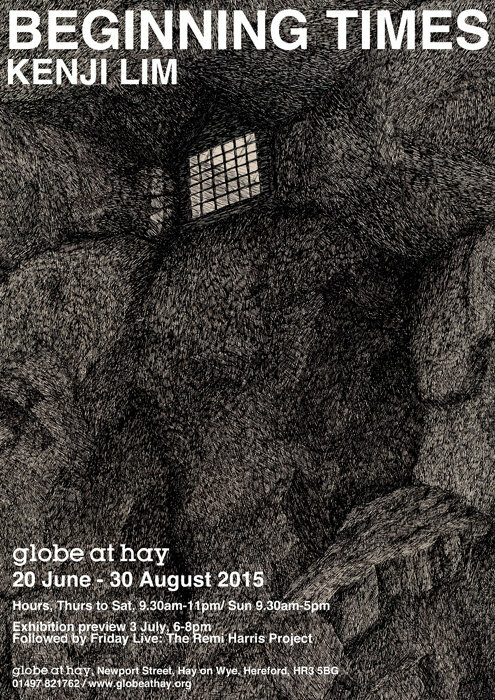 All of the works on show at Globe at Hay are for sale. Please contact the globe for details +44 1497 821 738 / emily.daw@artandideas.org.